Dom is one of the best winemakers in New Zealand. He was voted New Zealand Winemaker of the Year in 2018 and 2011, he also won the prestigious Decanter International Trophy for Pinot Noir in 2014. We had a nod from Rod Easthope that Dom wanted to break free, become an independent winemaker and create a brighter future for his family. Frankly it was a chance we couldn't pass up. Dom has made wine for some exceptional Kiwi wineries, including Muddy Water and Greystone. Now he's able to put his own name on the label to make wines for himself and for you. "I had early exposure to vineyards working at a friend’s family vineyard in my summer holidays. Once I travelled overseas, I discovered wine and was fascinated by a natural product that could evolve and gain in interest as it aged. I love both the physical and cerebral aspects. The thing I love most about winemaking? Creating something that puts a smile on people’s faces. Each season is slightly different so I love the aspect of feeling the harvest and adapting to suit it making the best wines possible....sort of like a challenge that changes slightly each season. My aim is to make delicious wines which should shine a little light (or a big one!) on that evening meal or glass with a friend. I hope Angels enjoy this chance to try wines out of one of New Zealand’s smallest winegrowing regions. I try to make wines that show an elegance and a clarity of the place they were grown. I think they have a personal touch that just can't be replicated. Bottling my first wine was a special moment. Sometimes the highs are as simple as tasting a beautiful barrel of wine during the day. Working in regions around the world; Burgundy, Rheingau and Oregon have been wonderful experiences. One of the things I've learnt along the way is there are never really failings...it’s all part of learning and evolving as a winemaker. You do what you feel is right at the time. The biggest sorrow I’ve felt...anytime the weather doesn't help us growing grapes....frost especially! People often ask what we see for the future... for me it has to be wines of greater depth and ability to age... both great things! Though if I had to pick my favourite awards moments… winning the top international Pinot Noir at the Decanter World Wine Awards and the top New Zealand Pinot at the same awards the following year. Taking out the top NZ Pinot Noir at the Air NZ wine awards and any time my wine wins a trophy is awesome. Being awarded NZ Winemaker of the year in 2011 is right up there too! 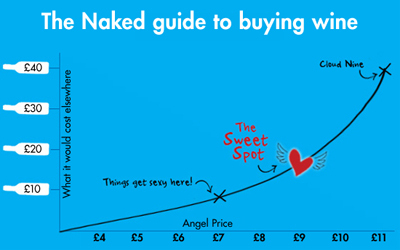 Naked Angel funding will be super helpful! It'll basically pay for the locally grown fruit, the barrels and the equipment to turn these grapes into delicious wine."